Fried chicken is quite a popular dish. With a crispy crust and tender juicy meat the chicken is delicious by itself and with a side dish. Besides to fry her delicious in the pan, you do not need any special culinary skills. Rinse thawed chicken in cool running water. Remove the innards, excess fat and cut into small portions. Put the bird in a colander and let the water drain, then dry on paper towel. Chicken should not be wet, otherwise crisp when frying will not work. RUB each piece with a mixture of black pepper and salt. Leave the chicken to absorb the spices for about 5 minutes. Put the pan on the fire and warm her. Then pour refined sunflower oil. It will take a little bit, because at the time of roasting chicken will extract the juice and fat. When the oil is boiling, lay out the prepared pieces skin side up. Turn down the fire to medium and cook about 15 minutes. Please note that the lid on the pan cover is not necessary. 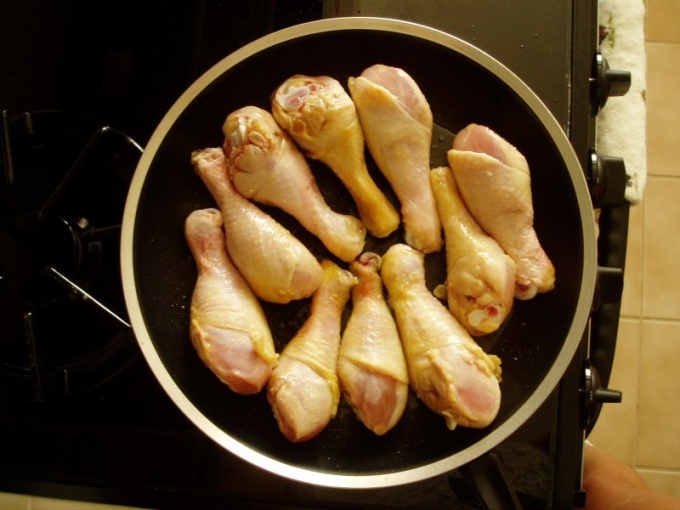 Flip the chicken pieces to other side and again fry them for 15 – 20 minutes, without covering with a lid. Periodically lift the chicken pieces with a spatula. If you notice that they begin to burn, reduce heat. Peel 3 cloves of garlic. Finely chop garlic with a knife or skip through chesnokodavilku. The chicken is fried on the average about half an hour. Check the readiness of dishes, pierced a piece of toothpick from the puncture site should leak a colorless transparent liquid. Flip the chicken again, skin side up. On each piece put the garlic. Necessary add vegetable oil. Cover skillet, reduce flame to low, and simmer the meat for 3 to 5 minutes. Turn over each piece of garlic side to the bottom of the pan, cover and simmer the chicken for 3 more minutes. Then remove the lid, flip the pieces of mouth-watering side with a Golden crust up and serve. On a garnish offer a potato puree, fresh, pickled or roasted vegetables, pasta, rice. Pour over chicken pieces formed when frying juice and decorate with greens.